There are millions of security risks everywhere. From every single decision we make, or do not make, we intake and exude an enormous amount of data. It might not seem so hazardous, in fact, very little so. What harm could buying something off the internet be? Or what harm could not logging out for a day or so be? Truly, these unapparent safety concerns barely exist in any individual’s mind. Therefore, it is inevitable that one might think of this as secondary, or brush it off as an over thinker’s thought process. Here is right where you must stop, pause and think. The world is buzzing with data. With every step of the way in an online journey, data gets emitted and carefully stored. So where does all this data go? How is it used? Furthermore, how deeply, safely and thoroughly is it stored? These are the right kinds of questions that you must ask your own self. In a workplace, computerized data is perhaps the most existent and apparent way of methodological storage of any information. It must be understood that all kinds of companies use data, but they need to store and safeguard the data as well. This data is generally information collected from their own employees, customers and other stakeholders. 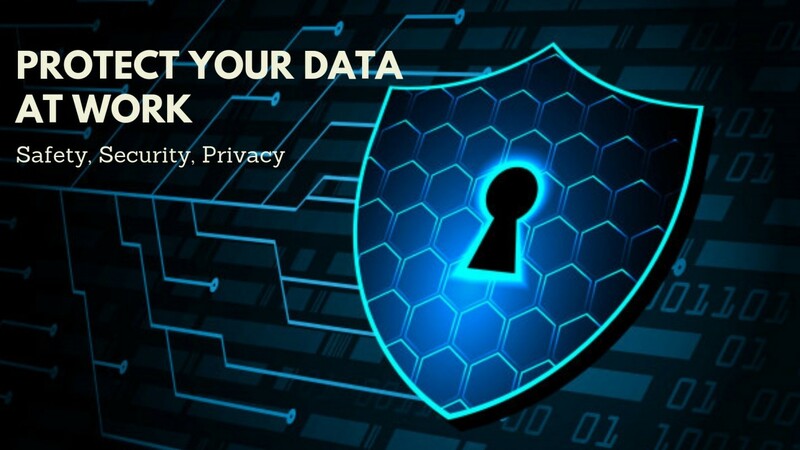 Besides the customer and employee factor, companies need to protect data in order to protect the company’s proprietary information. Unfortunately, with such a rapidly paced world and the overgrowing technology, there are certain risks- especially when it comes to the data and information world. The whole concept of portability gets questioned when it comes with such risks. Employees, and even customers, challenge the security of the company when they use their portable devices. These devices store the data, and it travels around, everywhere the device goes. 1) Blink and miss: The biggest risk is, of course, that it could easily get stolen. Not only is the expensive tech gone, but also all the information about the company is gone with it! 2) Hacking: The age old, common way to lose information: hacking. Though this can be done on an official, company’s device; it is far easier to apply on a personal computer. Besides, hackers can very easily steal the data from portable devices. This is bound to happen when employees connect their devices to WiFi networks or free hotspots in coffee shops, cafes, airports, and other such public places. 3) Glances: If someone wants to steal the information, working from a portable poses as a great risk. People might read the information from the portable device from behind, or sneakily glance at it. Now, how can important data be protected and kept securely, at least to an extent? Protecting Data in the Workplace: How can security be improved in the workplace? Protect the device with a strong password (that only you know, and will easily remember). Wiping off capability, in case the portable device gets stolen and the data has to be immediately removed. In case of several failed logins, the device should have an automatic lockdown feature. Companies perform vastly extensive tasks and use different tools to keep their data safe. Of course, the size and growth of the company are directly proportional to how far they will go to safeguard the data. Some companies find it more than enough to hire a bunch of IT employees, some companies try for a more combined and integrated approach. For a far safer approach, an integrated method of ensuring data safety is decidedly a better choice. Such cross functional security teams help in pointing out the various troubles, and the different perspectives of exposure when it comes to data risks. From finding out the right kind of people in each sector to help out with the task, to forming a group amongst them and storming the right kinds of ideas, and then finally carrying them out; this requires detailed step-step work. Likewise, a whole lot of important work goes to the employees as well. It isn’t just the employers job to protect all the data stored in the company’s devices or the portable devices of the employees. Employees need to know exactly what gets stored where, and how safe they think the data is, or if there seems to be any risk associated with storing data at any particular place. Employees need to know how to use firewalls, strong password settings, restricting downloads, encrypting data and monitoring for attacks; whether or not they are from a technology and computers background. Thus, it must be noted that the importance of keeping a company’s data safe and secure is definitely not a one man’s job, it is definitely the job of every employee working for and with the company.